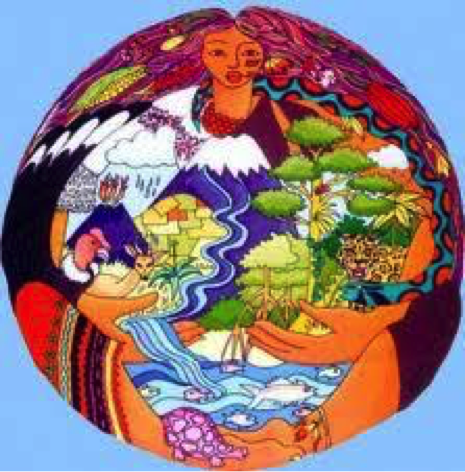 Buen vivir is an ideology that finds it origins with the indigenous people of the Ecuadorian Andes. There are other areas in South America that share similar ideologies that are placed under the umbrella of Buen Vivir. In 2008, this ideology was introduced to Ecuador’s constitution and this marked the first time that nature has been given rights in a constitution. Eduardo Gudynas, a senior researcher at the Latin American Center of Social Ecology (CLAES), believes this political process began “first with a reaction to the neo-liberal market reforms in the late 1990s and early 2000s(which included a strong critique of classical development strategies), and second, with the election of governments of the Latin American new left or progressism, that allowed the expression of indigenous knowledge and traditions that were oppressed, minimized or subordinated over centuries.”(Gudynas, 2011). Artist rendering of Buen Vivir, courtesy Google. a need to escape it. Moving away from development towards alternatives has allowed different perspectives to be heard not only locally, but is opening Ecuador the World. (Gudynas, 2011). 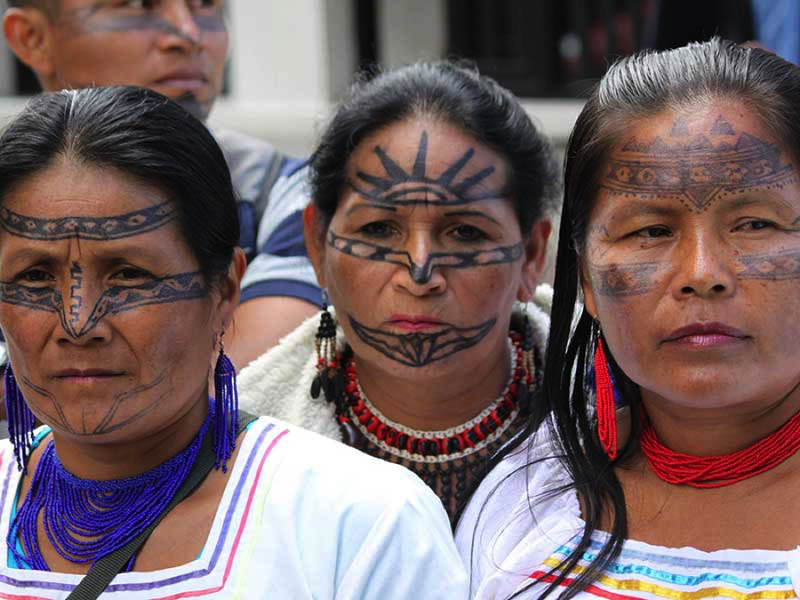 Representatives from the community of Sarayaku denounced the illegal entrance of Ecuadorian government representatives from the hydrocarbon ministry who were seeking to conduct an environmental impact study. 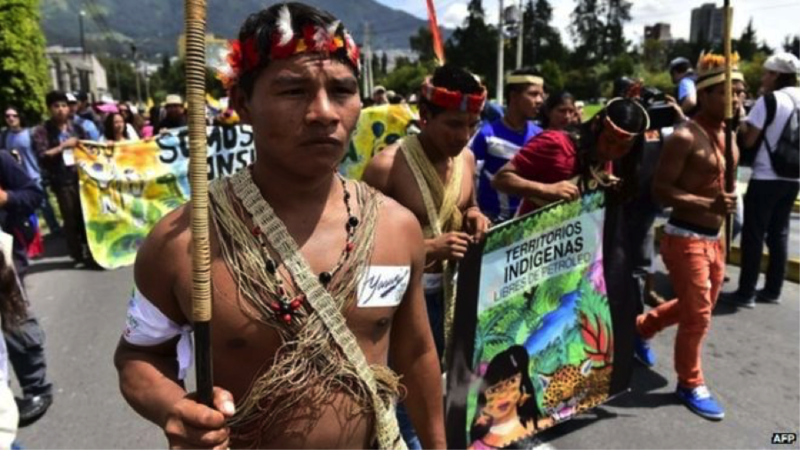 In 2014, Ecuador began entertaining bids on rights to land and the minerals that they contain in areas where indigenous people have been isolated voluntarily and are dramatically against the oil industry. According to Kevin Koening of Amazon Watch, “the Correa administration seems intent on trying to drill its way to prosperity, which has turned what was once pristine rainforest into a natural sacrifice zone crisscrossed by oil wells, roads and palm plantations.” It seems like any easy decision not to drill and preserve the Amazon rainforest, but there is a lot for popular President Correa to consider. (Mirroff, 2015).